In the late afternoon on June 4th 2018 this cow/cal pair of blue whales interacted with offshore Bottlenose Dolphin, as well as approached our small vessel. Note the whales approached us, and we either had our boat our of gear, or engine completely off when approached by the whales.Filmed with a DJI Phantom 4 Professional. The massive whales appeared to be feeding,because they circled around the same area for the 35 to 40 minutes he was with them. 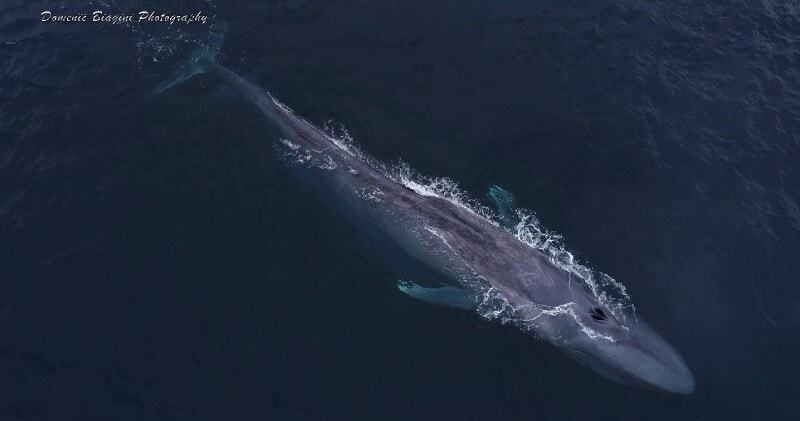 The calf was especially playful, he said, and the whales came within 10 feet of the boat.The photographer, who goes whale watching almost every day, described it as his best blue whale encounter ever.